Remember growing one of these as a child? 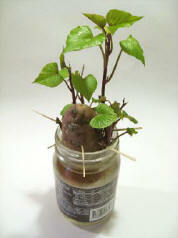 Although you didn't know it at the time... this was your first attempt at hydroponics! "The cultivation of plants by placing the roots in liquid nutrient solutions rather than in soil". Now, I know that you've arrived at our website wanting to grow more than just a potato vine on your windowsill... and we'll get you where you want to go... simply and easily. But with a solid knowledge base to guide you. You would think Lava rock would make a good Hydro medium. Not! Lava rock changes the pH of the nutrient solution and releases a harmful sediment. The hallmark of hydroponic gardening is a soil-less growing medium... No soil! But plants need to be supported or held up somehow, right? We do this with soil-less media... inert, non-organic materials. If you open up any hydroponics catalogue, you'll quickly become confused by the array of hydroponic growing medium choices available today. That's it. Forget about gravel or HigroMite or vermiculite or rockwool. Later, if you want to branch out and learn about other growing media, visit our "Advanced Hydro" section (coming soon). For now, all you need to know about are the "Big 3": Coco, LECA, and perlite. Each has advantages and disadvantages, and so are better suited to specific growing systems. Coco Coir and perlite are denser, and hold water better, but LECA has superior drainage and aeration. 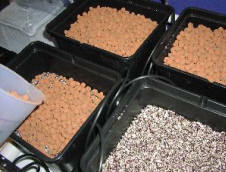 Experienced hydroponics nuts usually have their own favorite formulas using these 3 media. 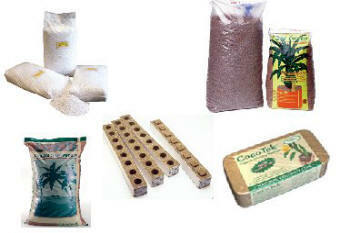 We recommend only three media for your first gardens: Coco coir, perlite, and LECA balls. In our plans of the 4 simple hydroponic systems, we will include the recipes that work best for each, using only these three substances. *The Raft: the nutrient solution IS the growing medium! *Dutch Buckets: Fill with 50/50 mix of Coco & perlite; add 1-2" of LECA balls on top to cut down on algae growth. *Auto pots: 50/50 Coco coir & perlite. No clay balls. TIP: Put the LECA balls where the solution enters the system. This helps keep the lighter media (perlite & coco) from washing away. Good news! You can sterilize and reuse all three of these growing media by treating with a 10% bleach/water solution, then rinsing well. Leave the medium in the pots. Take them outside, drench with the bleach solution. Flush gently but thoroughly with clean water. Leave them outside to drain and dry out. We've even left them out in the rain for a good shower. Those pre-packed pots will be ready for the next crop! Whew! Lotta great tips in this box! Want to learn more about these hydroponic growing medium? Soil-less substrate? Great! Knowledge is power!